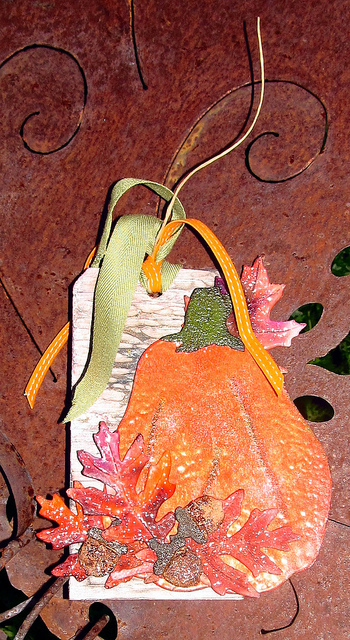 The Gentleman Crafter: Fall Tag With Mom! It's been a few days since I posted and I'm going through withdrawals!! I was however enjoying each and every minute of my holiday weekend. I hope everyone had an amazing weekend and are relaxed and fulfilled. I cannot even begin to say how I'm wishing and wanting some cooler weather. It kinda puts you more in the mood to craft for Fall! Today it climbed up to 101 degrees and we are told to expect more of the same for the rest of the week. Oh yeah, we will get a cool front coming through on Saturday and they forecast it to go down to 90! At least that's something! LOL! Anyway back to Fall...Mom came this weekend and we had a wonderful time talking and creating. I think I did more of the creating and she did more of the talking, but it was so nice having her by my side! We worked on a Fall tag we would like to share with you. The tag involved pulling out the "Flame Thrower!" Remember me talking about this wonderful invention on my old blog? If not, it's a creme brûlée torch that has inherited the name above. I totally think one needs a license to handle one of these babies! :) You could do some serious damage if you don't watch what you are doing! Yep, won't go into details. 1. We applied paper strips with tape to the tag and sizzled them with the Flame Thrower :). 2. We painted the sizzled goodness with Gesso and then inked it with Vintage Photo and a bit of Black Soot Distress ink. 3. Cut out all the dies. 4. 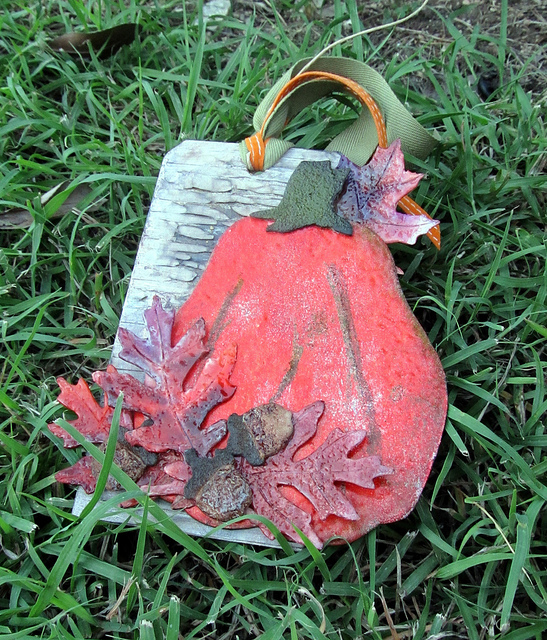 Applied modeling paste to the leaves and acorn bottoms. Let dry. 6. Applied UTEE to the leaves and embossed. 8. Inked The acorns with Vintage Photo and a bit of water. 9. Applied Spiced Marmalade Distress Embossing powder to the Pumpkin and added lines with Vintage Photo Embossing Powder. 10. Cover the surface of the pumpkin with UTEE and embossed. 11. Put all the pieces together and glued in place. Well that's it for tonight y'all...Many projects are int he making! MANY! LOL! Beautiful tag!!! I'm with Frances...been checking for your "MOM" post MULTIPLE times each day...ALL weekend!!! Yes...I'm stalking...and proud of it...LOL!!! It's still downloading Y'all! One day I hope! SLLLLOOOOWWWW Internet! The tag turned out really nice. Had no idea where you were going with this when you turned that flame on? it turned out quite nicely. Thanks for sharing. Its great - I love all the texture. What a fabulous effect you got with the "flame thrower". Glad Mom was by your side supervising. I am sure you probably gave her a heart attack with that tool. Can't wait to meet her on your video. Hope you had a wonderful visit and a great long weekend. Hubby and I got a lot done (cleaned house and worked in the yard). Things I find hard to do when I am watching the twin grandkids. Hubby & I should have been excited to have three whole days to ourselfs, but really missed their antics and laughter instead. Mom rocks! Love the background on this tag! What fun to have Mom by your side! Love this tag. Not so sure about the flame thrower part, but think I can handle the rest, ha, ha. I know the temperature doesn't feel like fall but your projects help set the mood. GREAT tag! I love that you whipped out the Flame Thrower for a tag and all of your texturey goodness is sah-weet. I just watched the video with you and your mom crafting. I love how the Tag turned out, I love the pumpkin! Thank you for sharing!